The arsenic blood test measures the arsenic blood level. What is an arsenic blood test? The arsenic blood test can help identify arsenic toxicity / arsenic poisoning. How do I prepare for an arsenic blood test? Avoiding seafood consumption for 48 hours before getting an arsenic blood test is recommended. This Arsenic Blood Test is a blood test. To get an arsenic blood test near you, just order online and get your blood drawn at the Quest Diagnostics lab that you chose. Once your arsenic blood test results are ready, they will be available for download. 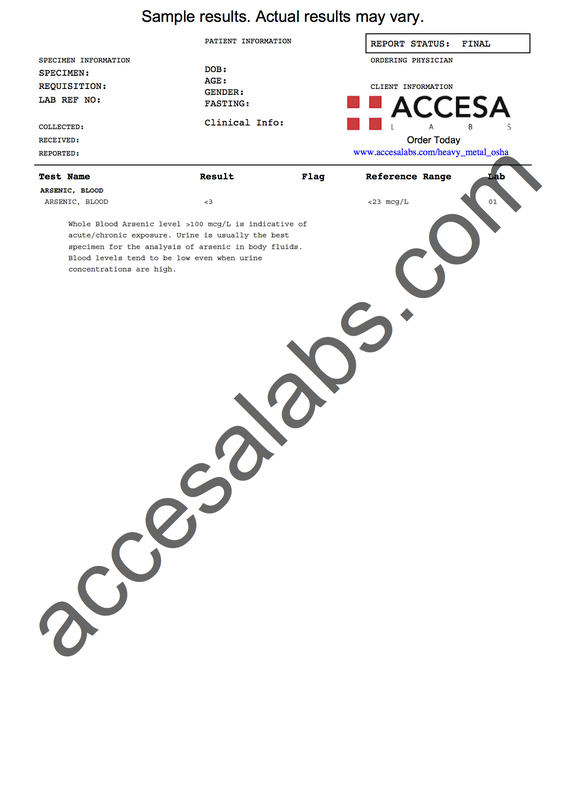 As can be seen on the sample arsenic blood test lab report above, the arsenic blood level is reported as a numerical result and can be compared against the reference ranges provided by the lab. Blood arsenic levels are useful for checking for recent arsenic exposures but, because arsenic is processed by the body quickly, only stay elevated for a relatively short period of time. As an alternative to blood testing, the arsenic urine test measures urine arsenic levels which can detect exposures over a longer period of time. The arsenic blood test is a component of the heavy metal blood test panel. Please note that the arsenic blood test was developed and its analytical performance characteristics have been determined by Quest Diagnostics. This test has not been cleared or approved by FDA. This assay has been validated pursuant to the CLIA regulations and is used for clinical purposes. Arsenic Blood Test at Guaranteed Prices.